When does your concept of home shift? At what point does that one particular tree, the one marking the turn down the road where your childhood home was, no longer symbolize the way home for you? I was on a plane recently, traveling back from England where I went for a week sans family. As my plane dropped altitude and banked gently to the right over the twilight lit ocean below, I spotted the Turning Torso of Malmo and immediately shifted my gaze 15 degrees further southeast and caught sight of the Oresund Bridge. 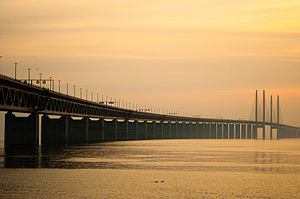 The bridge gracefully reached out from Sweden, gradually curling towards Denmark before lightly immersing itself into the sea below without quite reaching the other side. The hush of dusk lay across the channel as the bridge’s lights steadily blinked in greeting for the approaching night. At this moment, this silent moment before touchdown a feeling of warmth and happiness bloomed within my heart and shined through my smile. I was coming home. I was returning to my family. I have been living in Sweden for one complete year and I have passed by this bridge many times before, including the very first day of my arrival; but, it has not been till now that this particular bridge has become my symbol for home. I know that once I cross this grand construction of steel and cement, I am nearly home. At what point had this Nordic bridge replaced the majestic and mysterious golden spire and dome of Shwedagon Pagoda in Yangon to become my new symbol of home? At what point did that one particular tree, the one marking the turn down to m childhood home cease to be my way-marker for home? At what point will this magical shifting of home cease to amaze me? Previous Previous post: Happy Birthday Sir K! !